have parts that are organized and are ready for easy, instant selection. Using a pick rack system keeps small parts safely stored. Rugged steel construction of the pick rack systems supports heavy loads. Angled shelves keep small parts in the front of the pick rack systems bins for easy viewing and picking. 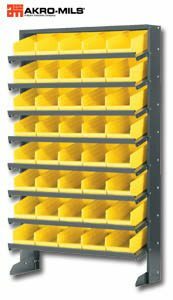 We offer new and used pick racks for convenient high-density storage. The pick rack system has polypropylene bins. For Immediate Delivery and The Best Prices Available on Pick Rack Systems call 1-800-300-6034 Monday thru Friday 8:00 to 5:00 E.S.T.